How do we begin to read and understand Scripture? First, we must honestly admit that we have cultural lenses through which we read Scripture. 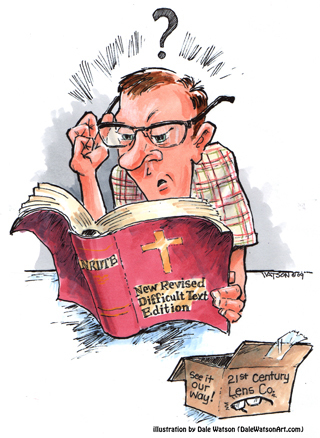 We are not First Century Semitic people reading Scripture, nor are we Sixteenth Century Germans. We are Twenty-first Century Westerners. What that means is we have been shaped by certain cultural forces and thought processes that were unknown in the biblical world. Many of our thought processes operate in the background of our lives, unconscious to us. This is not good or bad, it just is. As you read the Bible you will want to learn what the author meant and how his audience would have read and understood his words. Secondly, we have to be honest. It’s ok to be confused by parts of the Bible. It is, after all, a Story – a grand story of God’s interaction with His people. If you’ve not read much of the Bible you might not know the plot, the characters and the setting. All become more familiar as you read. Revelation is cumulative, not progressive. Similar to mathematics, we begin with simple math and move onto Algebra and Calculus. God’s revelation in Christ is the climax of a long series of revelations. Whereas, the idea of progressive revelation implies an evolution from something crude to something sophisticated. Revelation is cumulative. That’s why the Old Testament is important – it’s Act One of the Drama of Redemption. The New Testament interprets the Old Testament. All of the Old Testament anticipates and points to Jesus. When He arrived He fit perfectly the portrait painted. He is the ark saving humanity. He is the Seed of Abraham. He is the Passover. He is the manna – God’s provision – in the wilderness. He is the once and for all sacrifice that the Day of Atonement pointed to. He is the perfect prophet of which Moses spoke . . . the perfect priest anticipated by Melchizedek . . . the perfect king sitting on David’s throne. Jesus is the substance of which the Old Testament shadows were simply a representation (see Hebrews 8). The Epistles interpret the Gospels. The Gospels are the story. The Epistles are the application of that story. For example: Jesus most often taught in parables. And, very often His hearer’s were confused by the story – think about how many times the Disciples pulled Jesus aside and asked Him to explain to them the meaning of the story He just told. In a similar manner, The Epistles help to give context and application to the Gospels. Universal passages interpret local passages. When we read Scripture we read of the revelation of God in a particular context. And so we will read in one place that women were to refrain from teaching. And yet, in another the Apostle Paul himself commended Apollos to the care and instruction of Priscilla – a teacher in the church (see Acts 18). Paul would write explicitly about the brotherhood of all believers, slave or free, Greek or Jew, male or female – the unity and equality of all in Christ. Universal passages interpret local passages. Clear passages interpret ambiguous passages. Peter wrote that Paul was difficult at times to understand. Doesn’t that make you feel better!? There are passages in the Bible that are hard to understand. There are whole books like Daniel and Revelation, prophetic and apocalyptic literature – that are difficult to understand because they are so ambiguous. Don’t get lost or hung up on the passages you don’t understand. Start with what you do understand and then work your way through those texts you don’t understand. A good commentary will help you with difficult texts.